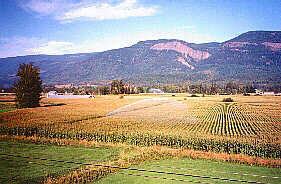 The North Okanagan includes a number of communities that lie to the north and east of Vernon. All have some special feature or activity to offer the visitor; whether it be fishing, swimming and camping or touring historic or commercial sites of interest. Travelling 23 km (14 mi.) north of Vernon on Highway 97A will bring you to quaint and historic Armstrong and Spallumcheen. These communities have a unique pioneer charm, enchanced by many heritage buildings and homes. Armstrong is a town full of history and today still provides a feel of the old west. Many original wood frame buildings are still resident in the town limits and within are a variety of shops. A museum and gallery, golf course, and exhibitions are just some of the features attracting many to this quaint town. Location: On Highway 97A, north of Vernon in the Okanagan. Accommodations: There are a wide variety of accommodations to satisfy all visitors; the many resorts, RV campsites and provincial campsites and parks are perfect for the outdoor enthusiasts while motels, bed and breakfasts and lodges are available for those who like a bit of "indoors".